Bergal-Kuvikas Olga, Nakagawa Mitsuhiro, Avdeiko Gennady, Rashidov V.A. Spatial compositional variations in Quaternary volcanic from the Northern Kuril Islands, Russia. 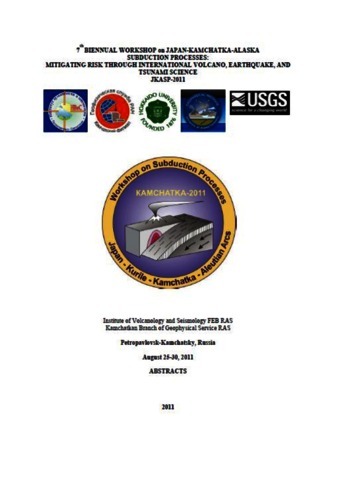 // 7th Biannual workshop on JKASP 2011: Mitigating risk through international volcano, earthquake and tsunami science.. 2011, Petropavlovsk-Kamchatsky. 2011. Girina O.A., Gordeev E.I., Melnikov D.V., Manevich A.G., Nuzhdaev A.A., Romanova I.M. The 25 Anniversary Kamchatkan Volcanic Eruption Response Team // 10th Biennual workshop on Japan-Kamchatka-Alaska subduction processes (JKASP-2018). Petropavlovsk-Kamchatsky, Russia, August 20-26. Petropavlovsk-Kamchatsky: IVS FEB RAS. 2018. P. 80-82. Gorshkov G.S. Kurile Islands // Catalog of Active Volcanoes of the World and Solfatara Fields. 1958. P. 1-99. The present volume seems to me to be a particularly im­ portant one for several reasons. Not least among these is the fact that it summarizes the work of two decades by G. S. Gorshkov, one of the world's leading volcanologists. In addition, it is the first general work of this length on the volcanism of what might be called a "narrow" island arc, a relatively simple megastructure as com­ pared with the "wide" arcs such as Japan and Indonesia. 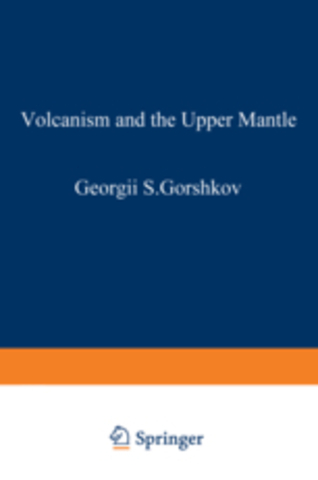 Finally, in this volume Gorshkov has summarized and cited extensive evi­ dence for his general ideas on the relation between volcanism and the earth's crust and mantle. A few potentially troublesome items should be noted here. In the translation the Russian terms "suite" and "series" have been retained, though for American readers these might better have been translated as "formation" and "group. " In almost all cases Russian place names have simply been transliterated rather than translated (e. g. , "Yuzhnyi Isthmus" rather than "South Isthmus"); in a few cases the English equivalent has been given in brackets where this is essential to the understanding of the author's com­ ments. The adjectives have retained their Russian case endings in the process (masculine -yi or -ii, feminine -aya or -'ya, neuter -oe) and this may occasionally lead to some slight confusion, for example, when the author calls a given feature Severnyi Volcano at one point and Severnaya Mountain at another. 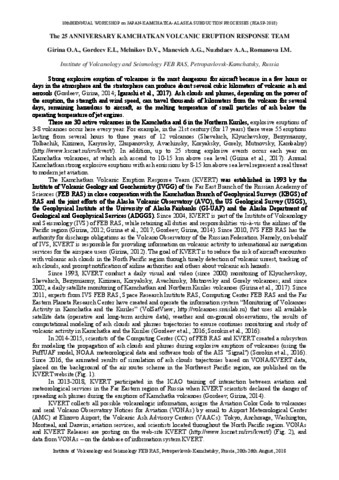 Volcano observatory notification to aviation (VONA/KVERT). 2011. Данная работа представляет собой анализ пространственного проявления вулканизма Парамуширской группы Курильской островной дуги. Исследования периодов активности вулканов и сопоставление объемов извергнутых продуктов, позволило охарактеризовать особенности магматизма на фронте и в тылу дуги в зависимости от глубины до субдукционного слэба и положения относительно зон разломов. На основе данных по локализации вулканизма, микроскопического и геохимического анализов его продуктов были установлены отличительные геологические и петрологические признаки вулканогенных образований трех основных зон: фронтальной, промежуточной и тыловой. This article represents a detail analysis of the spatial variations in volcanism from the Northern sector of the Kurile Island Arc. Investigations of the volcano time activity and comparison of the volume of erupted material made it possible to characterize features of the volcanism on the front and rear zones in dependence of the slab depth and location of faults. Data from volcanic location, as well as microscopic and geochemical analysis of its products allowed identifying geologic and petrologic peculiarities of volcanic formations in three main zones: the frontal, the intermediate, and rear zones.